Where the landscape of pastoral, rolling hills and fortified villages perched on small craggy peaks meets the Adriatic Sea, the ancient city of Fano offers a unique Italian experience, far from the throngs of summer tourists who tour the country. Fano, Italy is a charming beach resort town in the Marche region. Colourful cobblestone streets lead to historically notable churches and vibrant local market squares. Charming, narrow, cobblestone streets? Check. Quiet neighbourhoods and bustling market squares? Check. Colourful details, textural walls, doors full of character and the occasional friendly dog in a window? Check. The first historical mention of Fano dates to 49 BC, when Julius Caeser ruled the region. By 2 AD a wall and large arch had been constructed around the city, which can still be seen today at the main entrance to the older downtown district. Fano, Italy is a charming beach resort town in the Marche region. Colourful cobblestone streets lead to historically notable churches and vibrant local market squares. The Arch of Augustus is a Roman gate that has come to symbolize the city. Wandering the streets it is easy to get lost, but taking note of some of the distinctive churches throughout the city can offer useful waypoints. Cafes offer sunny nooks for enjoying an afternoon espresso and around every corner is another arched passage, revealing more colourful buildings and the sort of elegant patina that Italy is known for. With so much to see in and near Fano, Italy, this city and its history could fill the better part of an Italian vacation. I enjoyed how easily one could find quiet places to explore between the layers of old and new. While many Italians know Fano for its beaches and holiday atmosphere along the waterfront, if one ventures toward the heart of this ancient place, there are many beautiful, meditative moments to be discovered. 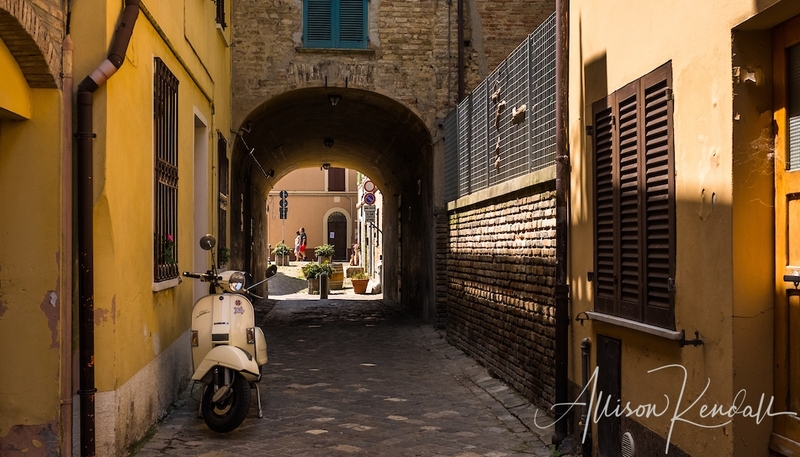 See the full set of my photos from Fano, Italy in the APK Photography archives, prints and licensing available.